You’ve probably seen forensic scientists on TV taking swabs and fingerprints from crime scenes. They aren’t wearing labcoats, hairnets and gloves to look cool but to prevent them contaminating their forensic evidence with their own DNA. But how do scientists deal with items that are already contaminated with unwanted human DNA? 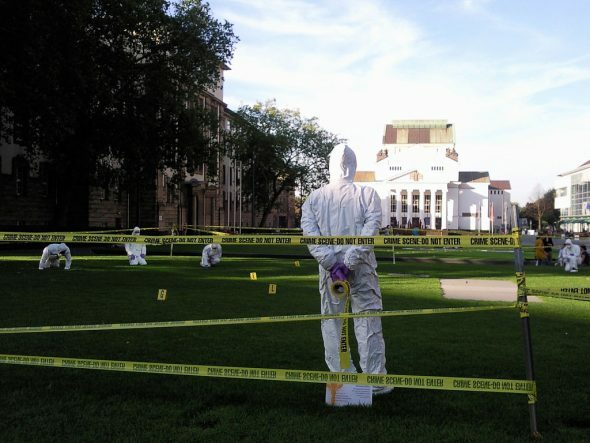 Forensic scientists processing a crime scene. Photo: Leonie aus Bonn. I recently encountered this problem when trying to identify the animal skins in a Malawian dance garment using a technique called DNA barcoding. This garment was the subject of a recent blog by conservator Anne Peranteau. 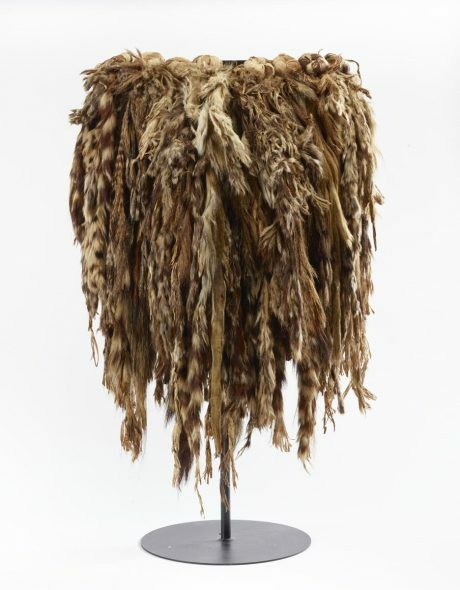 Prior attempts at identification of the species of animals making up this garment had been based on visible light microscopy. Cuticle scale patterns present on the animals’ hairs can be indicative of the type of animal used, but this microscopy technique relies on comparative reference samples. In this case, samples of known identity from Southern African mammals were not available. DNA barcoding was pursued because it offered a way to “match” the samples from the object with a library of DNA sequences collected and shared by researchers from around the world. Anne and I took samples from 10 different skins on the garment, each sample measuring approximately 3 mm square. Because we didn’t know what animals the skins came from I first tried to make copies of a small region of DNA present in all mammals called cytochrome b using universal mammal primers. Primers are short DNA fragments that match a particular DNA sequence and are used to selectively make copies of a target region in the genome (such as the cytochrome b gene). Universal mammal primers are designed to target a particular region of the genome from the DNA of any mammal species that may be present in a sample; but they won’t work for DNA from a non-mammal. The DNA sequences I obtained from each of the 10 garment samples exactly matched human DNA. Since the garment is clearly not made of human skin, this result suggests that human DNA has come into contact with it at some point in the past. Anne and I wore gloves when we handled it to prevent our DNA transferring, via skin cells, onto the garment. However, numerous people are likely to have directly touched it with their bare skin in the past, including past museum workers, and whoever constructed and wore the garment. I know of two methods used to overcome this type of human contamination. Firstly, stretches of DNA sequence that are unique to the animal under investigation, but NOT present in humans, can be targeted through the use of DNA primers that bind to the target sequence of the animal but do not match human DNA. This method was not suitable for our samples because we didn’t know what animal skins were used in the garment so it wasn’t possible to design primers to target them specifically. Hypothetical alignment of human and another mammal’s DNA sequence (reference DNA sequences). DNA primers have been designed to these sequences. The standard primer matches both mammal DNA sequences exactly. The blocking primer matches human DNA (bases that match human sequence but not the other mammal sequence are shown in red). The blocking primer ends with a C3 spacer, which stops copies being made of the human DNA.